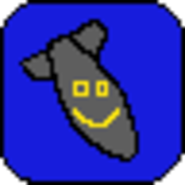 Atomic Bomber is one of those games that looks lame, but is addicting once you start playing... somewhat like Minecraft. You take control of a fighter/bomber that is defending Europe from a Soviet attack. The more enemies you kill, the more points you get! Anyway, this game is available on the Android Marketplace for free. There is a full version that costs $1.59, and that will let you keep upgrades when you die and will give you an onscreen joystick. On with the detailed review! Playing Atomic Bomber is as simple as tapping the screen. What really matters is when and where you do it. 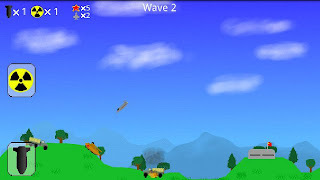 There is an infinite number of increasingly difficult waves, each one has randomly generated terrain and enemies, which makes the game different every time. In order to control the plane, just tap anywhere on the screen and it will move in that direction, even if it rams into the ground. To drop the bombs, just tap the bomb icon in the bottom corner of the screen. Occasionally, enemies will drop power-ups. They float up indefinitely, or until you pick them up. The power-ups are: atomic bombs, more powerful bombs, and more bombs to drop at a time. There are several different enemy types, most of which are buildings and non-lethal vehicles that drive back and forth. In the later waves, there will be SAM launchers, AA tanks, and Migs; all of which become very annoying in number. Atomic Bomber is an extremely easy game to catch on to. A few times through, and you will start to feel like a champ just destroying the ever-populating Soviets. With the simple tapping method for movement and weapons, it couldn't be easier. The problem is when getting in close to the ground, control seems to become clunky. Not only this, but occasionally missing the bomb button can throw a wrench into your survival. The little things like random areas and destructible environments just make the game continuously fun. A different experience every time is what will draw you back, as well as trying to beat your high score. Over a long time however, it does start to get somewhat boring. I've found that a few waves a day seems to not get overwhelming, plus it doesn't get boring. The few flaws in the game are definitely frustrating. Besides the disgustingly attractive icon (see above), the game itself is somewhat soothing. Solid colors almost make it look like a really good drawing in Paint, but nice gradients in the clouds and explosions set this apart. Could the graphics be better? Definitely. Perhaps more environments or just different enemy models would make it more enjoyable to look at. In Atomic Bomber, sound is generally lacking, but not for the lack of trying. There are only four or so different explosion sounds, but the sound of the atomic bombs makes up for boring, clicky regular bomb sounds. Other than the sound of explosions, there really isn't much of anything else. I guess the enemies firing does make sound, but it is barely noticeable and somewhat annoying. The only thing about Atomic Bomber that is somewhat annoying is the sound, but of course, you can play with it off. Otherwise, there is a really great game behind some very minuscule flaws. And most people don't even see the flaws! So all in all, the game is beyond worth a download. The full version will allow you to keep upgrades after death, which you will find to be amazingly helpful. Download the free version and if you play it for a few days, you should know the full version is worth it.